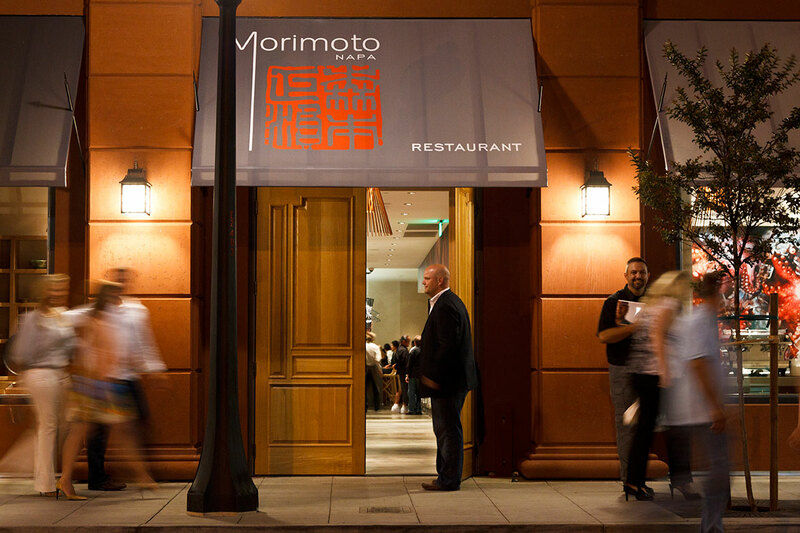 When you enter Morimoto Restaurant, Bar and Lounge, you will be quite surprised not to find yourself directly pushed inside a restaurant atmosphere. Instead, a wide-open retail environment greets you with accessories reflecting the Morimoto lifestyle. You can also enjoy a sip of sake or learn about Japanese prefectures in Momosan Sake Bar, Napa’s only Sake and Japanese Whiskey bar. As you enter the dining room, there is much to enjoy visually. Soothing grays, warm white oak shelving, and organically shaped dining and presentation tables are set in a very warm but streamlined environment. As you pass further through a long gallery of shopping goods behind glass vitrines, your eye is drawn to the open kitchen that gives you, not just a moment of “wow,” but also a glimpse of the genius behind the hotline. Diners then enter into the open floor plan consisting of fine dining areas, a lounge and bar, and a private dining section. Concrete floors compliment partition walls that are staggered in warm ash tones, giving you a sense of privacy but still never letting you feel apart from this soulful and textural environment. There is a sushi bar that features a natural wooden counter top, while wood-textured concrete becomes the material of focus for the main bar. Behind the bartenders and mounted around the room are 50-year-old local cabernet grape vines that are stripped down to reveal their veins. Tradition is still the inspiration for this contemporary environment. 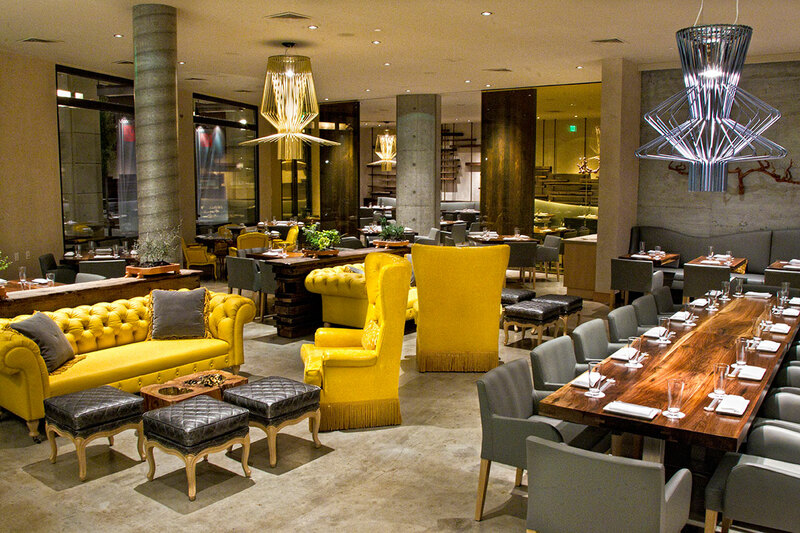 A juxtaposition of old-fashioned high-backed chairs, beaded couches, and a butter yellow color embrace the soul of Morimoto dining lovers. Crude wooden bases transformed into chic cocktail tables and finished off with a glimpse of gold anchor the lounge part of the restaurant. Comfy dining chairs, wooden table tops, and a textured straw-thatched wall are the elements of the main room that surround the diner. Wrought iron chandeliers cascade their silhouettes throughout the dining space. There is a whimsical feel that pierces through the back windows and opens up to the riverside dining terrace.